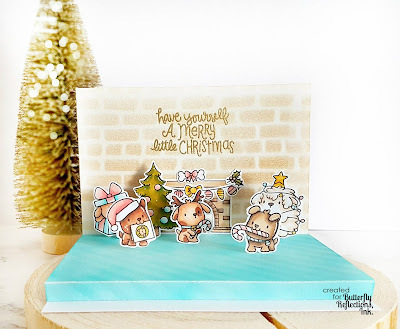 It's Friday and that means Alexandra here again today sharing with you an interactive card using Mama Elephant stamps. Now for my card today I started by stamping the critters from Yappy woofmas stamp set and also so accessories from Merry mantle stamp set from Mama Elephant , and then I colour them using Spectrum Noir Alcohol Markers . After that I took an A2 size card and started working on inside of my card , and first I ink blended the upper part of the card using Distress inks Antique linen and the I took brick stencil from my stash and using Vintage photo distress ink I started ink blending again to create a brick type of wall . Now was time to work on the floor and I took a piece of cardstock which measures 15x12.5cm and ink it using Peacock feathers distress ink and here too I took an stencil and added some details to the floor. Next I've measures 1 cm on one side of the cardstock and then at 10.5cm and at 11.5 cm on the both sides. After scoring and folding we have now the parts that actually create the floating floor. I've attached the floor to the card base using a strong tape . To add the critters I cut a small line on the floor and the creating an L out of acetate I've attach them to the card base . 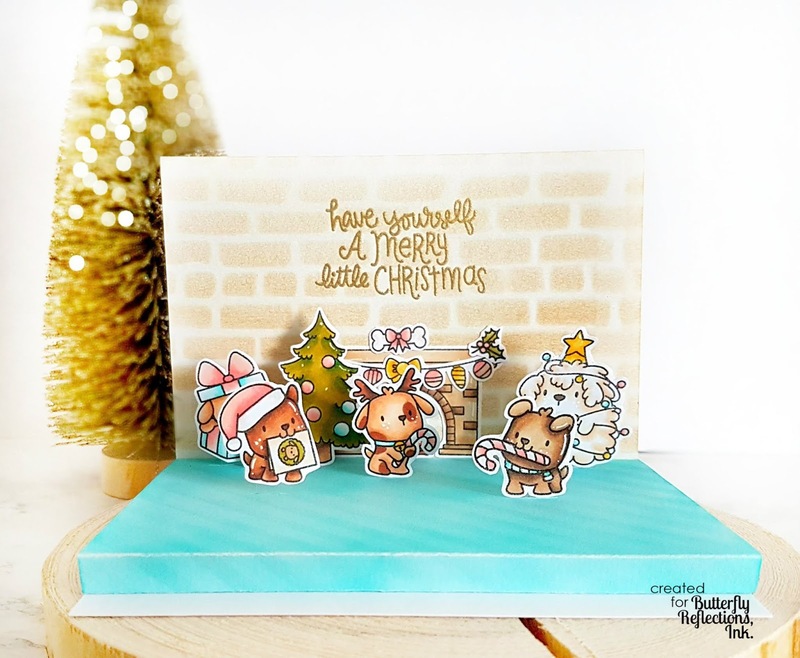 Now that all the critters are in place I added the sentiment from Avery Elle A merry little Christmas stamp set using gold embossing powder and Versa mark ink ! Hope you like my card ! Thank you so much for stopping by today ! Until next time have a great day! I haven't seen something like this before, it's adorable! Thank you so much ! So happy you like it!